Tucked away in the heart of Coquitlam is a little gem known as Como Lake. Although it seems like a little stale pond at first glance, Como Lake actually offers excellent trout fishing opportunities for local residents in spring and fall. There is not a shortage of fish as the Fraser Valley Trout Hatchery releases several thousand rainbow trout into it each year. Beside the protected section along the northern shoreline, the entire lake can easily be accessed from shore. There are two floating docks, making it very friendly for kids and anglers who are not as mobile. Como Lake is located at the western part of Coquitlam. The best road to drive along and park at is Gatensbury Street, which can be accessed either from Como Lake Avenue or Austin Road. Parking can be found at the lot on the north and south ends of the park, as well as along Gatensbury Street. The lake is small, so it only takes around ten minutes to walk around it. Fishing can be done year-round at Como Lake. The best fishing months are March to June, and September to December. 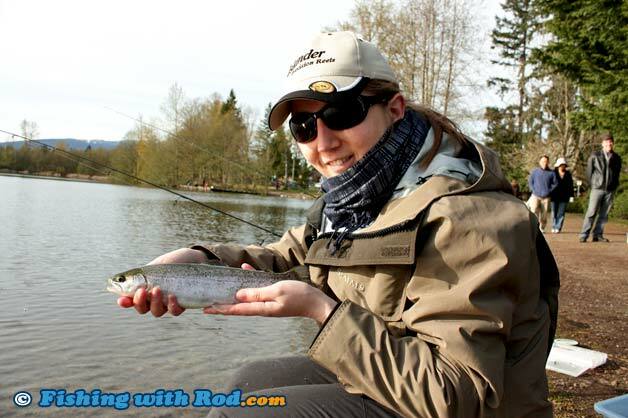 During spring and fall, Lafarge Lake is aggressively stocked with rainbow trout by the Fraser Valley Trout Hatchery. These rainbow trout are typically around 300g heavy. Anglers may also encounter common carp and brown bullhead, which is a catfish species, in the shallow parts of the lake throughout the year. While angling from shore is the most common way to fish at Como Lake, you can certainly use a float tube, pontoon boat, canoe or small craft to paddle around it. When fishing from a boat, slowly trolling a fly almost never fails. A size 10 or 12 dark leech pattern is always irresistible to these newly stocked rainbow trout. If you are fishing from shore, there are several common methods used. Bottom fishing with bait can make bite detecting more easily, but you are likely to encounter many brown bullhead. On a calm day, try float fishing with a small piece of shrimp or dew worm. Have the float depth adjusted to around 4 feet or less because the lake is not very deep. Finally, casting a spoon or spinner is another productive option. One common mistake that new anglers at Como Lake may make is to use a lure or hook that is too big. A lure that is 1/8oz heavy or less is the most ideal size for these small trout. You should use a hook that is size 4 or smaller on the lure. A bigger hook makes it difficult for the fish to grab. Como Lake is located in Region 2 in the British Columbia freshwater fishing regulations. Please respect other users, local residents and wildlife around the lake by keeping the noise level down and picking up your own garbage. If fishing from shore, please be aware of your surroundings before casting so you do not hook other park users.